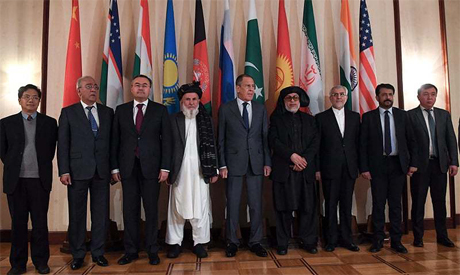 Moscow on Friday hosted international talks on Afghanistan aimed at kickstarting direct negotiations between Kabul and the Taliban militant group, both of whom sent delegations. Russia hopes "through joint efforts to open a new page in the history of Afghanistan," Russian Foreign Minister Sergei Lavrov said as the talks opened at a Moscow hotel on Friday morning. He said that the participation of both Afghan leaders and the Taliban was an "important contribution" aimed at creating "favourable conditions for the start of direct talks." "I am counting on you holding a serious and constructive conversation that will justify the hopes of the Afghan people," he said before the talks continued behind closed doors. They will not hold "any sort of negotiations" with the delegation of Kabul administration, he said. "This conference is not about holding negotiations with any party whatsoever -- rather it is about finding a peaceful solution to the issue of Afghanistan," he added. The Taliban is banned from operating Russia as it is classified as a "terrorist organisation". Pakistan, which has long been accused of providing support to the Afghan Taliban, would "definitely" attend, foreign ministry spokesman Muhammad Faisal told AFP. A US government watchdog last week said Kabul's control of Afghanistan had slipped in recent months as local security forces suffered record casualties while making minimal or no progress against the Taliban.